Okay, I've grown the thing. I have a couple of issues with it, however, and I can't promise that it might not come off soon. First, my beard is thick and full, and the hair is coarse. As a consequence, it often itches and can in fact be painful when I press my face against the pillow at night. Second, I have too much white hair in it, and it's making me look older than I am! I guess I can solve this issue with a bottle of Grecian Formula (truly Orthodox, eh?). But then, maybe I am older than I am . . .
Third, the wife prefers me clean-shaven (but she is pretty accomodating). Any practical suggestions from my fellow hairy-faced brethren? Shave it off. It doesn't sound like you or your wife likes it. You don't have to have a beard to be Orthodox. That is what I did, but not intentionally. Two days ago I had a go at trimming the face fuzz on my own since I now had a trimmer and wasn't too keen on paying a barber to do it every few weeks. I started on the right side and managed to do a pretty fair job of it, so my confidence was growing (Alert: wait until you have succesfully trimmed your beard at least three times before allowing confidence to grow, otherwise it can be detrimental to beard appearance.). I started trimming under my chin when I inadvertantly took a large chunk of hair off the left side of my chin . Alas there was no way to recover my beard from the damage so I ended up trimming it all off except for the moustache. I trimmed that off Sunday morning because I looked too much like Yanni without the long hair. Its a bit of a relief actually, not because of the summer heat or any facial irritation, but because my eleven month old son had taken quite a liking to pulling on my beard. He still pulls on my chin every so often, and seems mildly suprised that he doesn't succeed in doing so anymore. I kind of like the way the thing looks, but I guess I am just not used to it yet, because I always notice that it's there. I don't take it for granted. I still don't know what I will do, whether I will shave it off or keep it. I would like to hear from someone who has had one for a long time, how he adjusted to it and how he cares for it so that it doesn't trouble him. Does the thing stop bugging you when it reaches a certain length? 1. It depends on how long you want it. Most folks these days want a close beard, which means you have to trim fairly often (1-2 times per week). 2. Purchase an electric trimmer. 3. Err on the side of ltrimming it onger at first until the beard is fairly thick, when you can trim it down without trimming it off. Also, I have been advised (although I didn't do it), which was probably a mistake) to wait 4-5 weeks before the initial trimming. 4. Use the trimmer with the comb attachments. If you don't, it's very easy to trim off too much somewhere, and it looks fairly bad when that happens. 5. Start by defining a neckline (ie, where you want the hair to stop on your neck) with the bare trimmer. Then trim with the attachment, going in the direction of the hair growth, so that it is no longer straggly but still fairly full. That goes for the moustache as well. 6. Try to trim your beard after washing it, when it's still damp (easier to cut that way, as is the case for the hair on your head). 7. Remember to wash and condition your beard the same way you do as for the hair on your head -- preferably daily, if not more often depending on activity level. This helps soften the beard hair. 8. Consider getting it professionally trimmed once every few weeks. It costs (but not that much) and it's easier than self-trimming. You could get it professionally trimmed every 2-3 weeks with a weekly catch-up trimming done yourself in between. 9. If it's a pain, then just get rid of it. Certainly no big deal from the religious point of view. I didn't grow my own beard for religious reasons, anyway, but because I just thought it would be cool to have one. Thanks for the very good, very practical advice. I also got a PM from Nikolai that was likewise very practical. Thanks to him, as well. Still not sure whether I'll keep the beard or not, though. You can't complain, I'm 21 and I've had grey in my beard for about 3 years, which is one of many reasons why I'm almost always clean shaven. In your case, Jonathan, I would say that white hair is a sign of the wisdom you already display, though you are young. You should grow your beard back. Though it is advised above you should never trim when your beard when its wet! You hair is longer when wet and you'll end up taking more off than you should. It should be brushed or combed out at least daily. This is help get rid of tangles for better growth and much less pain/irritability. It also evens it's appearance. When growing a full beard, yes, wait 4-5 weeks (depending on your rate of growth) before trimming it down. You want your shortest hairs to be longer than what your desired length is after the trim. The best remedy for itching is to wash your face and scrub the beard area with a cleanser, preferably a pumice or granulated one, that contains sialic acid and then to moisturize. The sialic acid helps get off the crusty nasty skin bits that cause much of the itching. The moisturizer so you don't dry out, obviously. My own personal philosophy is that if you're going to grow a beard, then let it grow and leave it alone. Let nature do it's work. I also believe that it's a serious violation to dye or color your beard in any way. Just my own opinion. My own personal philosophy is that if you're going to grow a beard, then let it grow and leave it alone. Let nature do it's work. It really depends on the growth pattern of the beard. A very close friend's beard has a habit of looking like that of St Maximus the Greek if left untrimmed for too long. Once it grows past a certain point, it goes feral. But I completely agree with dyeing beards, and men's hair. Completely unnecessary, and it always, always, looks fake. The ONLY excuse for a dye job is if an actor has to play a part where his character has hair color which is different from the actor's. This was his problem. If you're using a pillow, you aren't fully committed to the cause. That's what I use to keep my goatee from turning into a beard. Doesn't all beards go feral? My beard turns into a jungle if I won't trim it and I've assumed that all beards are like that. For those with full beards who don't want to be at the barber's every couple of weeks, invest in an electric trimmer. They're not expensive. You'll soon wonder how you ever did without it. Wielding a pair of scissors while looking in a mirror rarely ends up well. Something to do with trying to get a 3D result using a 2D guide. And for those who have prickly beards, use hair conditioner to soften it. Big noob question I'm about to ask, this is kinda on the line of beards. I have always used those cheap BiC one blade shavers to shave my face every morning. I want to keep a five o'clock shadow, do I need to invest in an electric razor to achieve those results? Yes, get an electric shaver. They usually come with "guards" of various levels so that you can evenly trim your beard as short or as long as you would like. To maintain the 5 o'clock shadow effect, you will probably want to use the closest guard or perhaps not use the guard at all. During a certain 3-year period of my life, I let my hair and beard grow. During this same period I took a total of 10 flights between Logan International Airport in Boston and Dayton, OH. During this time epriod, I was "randomly stopped" 7 out of 10 flights for an interview by the various friendly TSA agents who wanted to know more about me, my travels, whether I could spell the word 'xylophone', etc. Then, I trimmed my beard into a goattee and was never bothered when traveling. Now, I have grown my beard back, but keep it neatly trimmed. We will see what happens on my next flight! You're a priest and you don't have a foot-long beard? Is that allowed?? The ONLY excuse for a dye job is if an actor has to play a part where his character has hair color which is different from the actor's. It is permissible for an Orthodox Christian to be an actor?! Being skilled in the manly arts, I sigh reading this thread. Achronos, at least you didn't buy into multi-blade disposables. You know where I work, I think. We make most of the crap like that you are going to buy. Adding blades is just BS. Safety razor, badger brush, proper shaving cream. My beard hair in parts is as thick and of similar texture to those of recent African descent, which is to say the worst kinda hair to shave. Until I discovered the above combo, shaving was a PITA. Always irritated skin, inflamed hair follicles, etc. So I just kept it as short as possible with an electric beard trimmer, which I killed every so many months. But I do have to shave on occasion. And with the proper technique, the above combo can shave my face cleanly, quickly, and without even a touch of irritation. I use a respirator from time to time at work. I am glad I know how to properly shave. From time to time at work, I am in temp control rooms from anywhere from 120F to -20F. When we do longer term work in the colder rooms, I grow out my insane beard. Scissors and a comb with practice is by far quicker and easier than using a store model beard trimmer, especially if you have the density and thickness of hair that I have. I will quickly burn out a commercial beard trimmer and they take a long time to use cause they often just push the hair out of the way rather than cutting it. So, opt for a professional model with a wide arrangement of lengths of attachments. Do not trim it along the way while you are growing it out, until you get to a "full beard". Just cut the hair along your lip line. And if you must "shape it" and you just must. Then just the stray hair above bulk of the hair on your cheeks and the hairs around your neck lower than your adam's apple. Let the beard grow in to a full beard without playing with it. It takes me less than two weeks, some it takes a month or a little more. If you are going to have a real beard. Do not shave or substantially trim shorter the hair from your adam's apple to your jaw. It looks ridiculous. God save me from the chin straps as of late. You can play with how low you would like to go parallel to the jaw line. But I would opt for as little trimming as possible. You are thin and have bone structure, thus you don't need to cultivate facial lines via trimming. Anyway this is getting way longer than I thought it would. Question as you wish. Electric shavers, and disposables are junk. Commercial beard trimmers are OK if you don't have beard worthy of a Greek God. Safety razors and scissors for the win. Professional beard trimmer if you are lazier. Awesome post orthonorm, yeah "Safety Razor" is foreign language to me. Didn't you say you used to work for a toothpaste company? Would you laugh at me if I bought into the hype over a Philips Sonicare toothbrush? Cheaper over the long run than any solution sides a straight razor, I dunno I would suggest that option to most people as they really don't understand how to keep a blade. i am not an employee, but i am a very happy customer. you can learn about using one, care, etc at Straight Razor Place and there are very affordable sharpening services there, as well. Learning how to use a straight razor was one of the best things I've ever done. Wasn't sure if we could post such links. I am a customer too. Montalo, most people cannot keep an edge on their cooking knife much less a straight blade used for shaving. Really keeping a blade is an art. If you go that route, I would get a cheaper blade to "practice" with and find someone who knows how to keep a blade up for its maintenance outside of the most trivial honing. Remember a sharp knife is a safe knife; a dull one, a dangerous one. Didn't Sweeney Todd use a straight razor? I didn't know how to really keep a knife until I started shaving with a straight razor. Now I'm the proverbial fascist about our kitchen cutlery. That last Broadway revival was SICK! Sondheim is awesome. Amazing production. And like any good barber he had more than one to use. 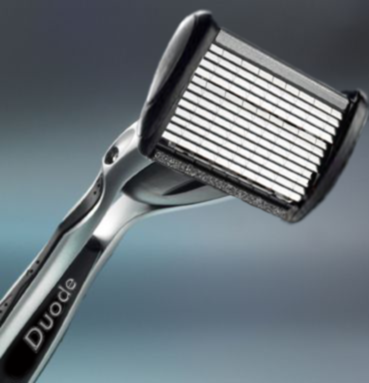 Alternatively, you can also use a Dovo Shavette, which uses razor blades like a safety razor but cuts like a straight razor. It's a good route to go to see if you'll enjoy using a straight razor w/o the initial outlay for a blade and strop, which can get pricey, as you want to buy quality from the get go. Dude, I wince when I see people going with their knives with their "sharpener" and they think me crazy for honing mine multiple times when doing a lot of slicing. And he often put them to more than one use.